It takes a village. So true! It’s true for both real estate and restaurants.Because clients always ask, every once and a while, I like to share what I know about my favorite spots in the area. In this case, The Village (Pub) in question began with Tim Stannard. Tom is the founding partner of Bacchus Management Group, who took this historic location in the heart of Woodside, CA and with a talented team, put The Village Pub on the map of “must visit” SF Bay Area, gastro-pub destinations. Executive Chef Dmitry Elperin takes each day as it comes and holds the hand-selected ingredients of every dish in the highest regard. As he walks into the kitchen at the start of a new day, it is his mission to draw out the exquisite flavors that the finest seasonal ingredients have to offer. He and the team at The Village Pub in Woodside, CA have meticulously refined this pub in the hills into the award-winning gem and San Francisco Bay Area favorite it is today. The Village Pub takes their food philosophy and dedication to locally sourced, fresh ingredients seriously. It is their partnership with SMIP Ranch that allows Executive Chef, Demitry Elperin and Chef/Partner, Mark Sullivan to freshly select nearly 80% of each day’s produce from land in the hills above Woodside. In case you are curious, SMIP Ranch is an acronym: “forsic manebimus in pace.” And if your days of fluent Latin are behind you, that translates to “thus we will remain in peace” – apt, I’d say. This is a beautiful, five acre, organic, ranch dedicated to growing all manner of sustainable produce free from synthetic pesticides, herbicides, and fertilizers. Long-standing relationships and collaborations with local farmers and land owners keep The Village Pub focused on its mission – to be an active participant in the global movement for “earth stewardship.” Year after award-winning year, The Village Pub does its part to promote sustainable food and deliver fresh, farm-to-table fare. 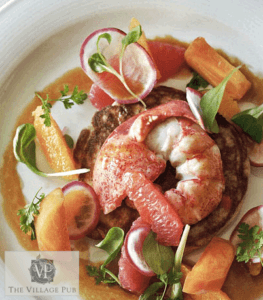 The Village Pub offers patrons a menu of French-kissed, contemporary American cuisine – delicious and fresh, with flavors that range from exquisitely delicate to bold and impressive. I love the sustainable, seasonal cuisine. Perfect presentation. Impeccable service. To me, this is an ideal dining experience. Furthermore, the Village Pub has a wonderful bar with specialty cocktails and custom-made gins from local distilleries. The ambience alone will have you coming back for a glass of wine, the ultimate date night or that special occasion with a larger group. I would suggest that you make reservations well in advance for the best seating. A basket filled with a bouquet of fresh-out-of-the-oven breads, including a favorite, so fluffy and with the perfect hint of sweetness topped with a sprinkle of sea salt. Dishes such as Arctic Char Carpaccio, Kale and Ricotta Racioletti and Mushroom Truffle Risotto which comes dappled with truffle oil that exceeds even the highest of expectation. Red Wine Braised Short Rib, Maine Diver Scallops, Stone Valley Farms Pork Chops. Rhubarb Crisp, Chocolate Soufflé and phenomenal cheese selections – cow, sheep and goat. A treat, surprise and delight at every turn. Vegetarian, dairy-free, or gluten free? 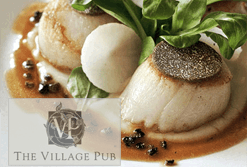 The Village Pub has plenty for you to enjoy and will happily accommodate any dietary restrictions. The Village Pub offers several private dining options including three private dining rooms and veranda, for delightful outdoor dining. The Village Pub will easily accommodate a casual weekend brunch, private cocktail reception or a formal sit-down dinner. In addition to the exclusive dining rooms, The Village Pub provides consulting services and a selection of catered “dining experiences” for private business events, that quiet evening in your home or special venue, or a celebratory event in the San Francisco Bay Area, The Village Pub needs to be in your phone! More from The Village Pub in our next article where we’ll take a closer look at Executive Chef Dmitry Elperin. 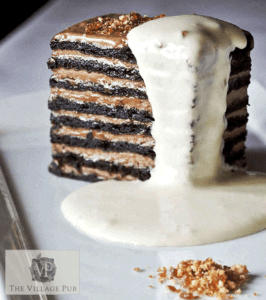 Photo Credit: A special thank you to The Village Pub for the use of their delicious photos.